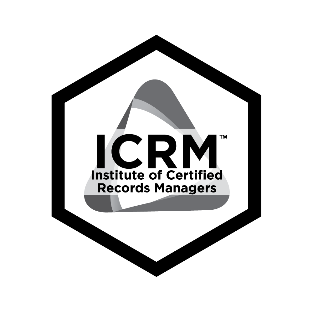 The logo is the sole and exclusive property of the Institute of Certified Records Managers (“ICRM”). The current, trademarked version of the logo may be used only by ICRM members in good standing and according to the terms identified in these Guidelines. With consent of the ICRM President, non-members may be allowed to use the logo. Right click this link and choose “save as…” to download a copy of the Black and White ICRM logo. Right click this link and choose “save as…” to download a copy of the color ICRM logo. ICRM members in good standing and/or who are also members of affiliated associations that have a valid professional purpose may us the logo on all relevant printed materials, printed communications, electronic communications and websites. ICRM members or ARMA members/presenters who want to add the ICRM logo to her/his Power Point presentation. These presentations must be educational in nature. 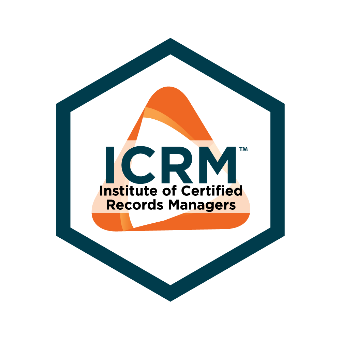 The use of the ICRM logo does not imply endorsement of a product or service. Authorized by these Guidelines to use the logo may do so for professional purposes including business cards, stationary, literature, advertisements or websites. All written correspondence conducted by the ICRM Board of Regents or specified positions shall be on white stationary with the color, trademarked version of the logo (reduced to a smaller size) used at the top of the letterhead and left aligned. Is used in a way that falsely conveys an endorsement of the product or service. The logo is protected and has been trademarked. Use of the color version shall be standard in all cases except for when the black and white graphics are required. Never Place the logo on a cluttered background and make sure the background ensures good legibility. Login as a member of the ICRM on the website and download the logo(s) or download the logo(s) from the links provided on Page 1 of this Guideline. It’s already above, so this doesn’t make sense to me. The ICRM has established a formal publishing style to ensure consistency in branding. All correspondence and publications shall be recorded using Arial 12 for text. Headings and titles shall be the same font in a larger size. Use of the ICRM logo shall create no rights for users in or to the logo and all rights arising from such use shall inure to the ICRM. The logo shall remain at all times the sole and exclusive intellectual property of the ICRM. Without further notice, the ICRM reserves the right to prohibit use of the logo if it determines that a users use of the logo, whether willful or negligent, is not in accordance with the terms and conditions of these Guidelines. ICRM also reserves the right to prohibit use of the logo if the use could discredit the ICRM, could tarnish the ICRM’s reputation and goodwill, or if the user is not an ICRM member in good standing or otherwise authorized by the Board of Regents to use the logo. Any questions concerning the use of the ICRM logo or the terms and conditions of these guidelines may be directed to the ICRM President at president@icrm.org.